Anxiety is inevitable for most of us. In this economy, many of us are worried about excessive bills continuously piling up, while others may be thinking about urgent deadlines at work or failing grades at school. You might be wondering: Is it possible that your new found belly fat might possibly be related? The answer is: Yes. But, there is good news! You can do something to whittle that tummy away. When you're worried or pressured, your body releases adrenalin, a hormone that gives you instant energy. Along with adrenalin, your body also releases cortisol which increases your appetite and ultimately drives you to eat more in order to replenish your used energy. People who frequently experience anxious situations consume comfort foods, especially high-calorie foods, even when not hungry. This habit leads to an unhealthy diet that causes you to gain weight and "visceral" fat - which is fat stored around the midsection and commonly known as belly fat. This is the most dangerous type of fat you can heave because it can lead to cardiovascular disease and diabetes. Knowing that anxiety affects your body in various ways, it's best that you take action to mitigate unwanted effects. Here's how you can interrupt the cycle and stop weight gain. Exercising not only burns calories; it also helps you feel better by releasing a cascade of hormones and biochemicals that lift up your mood. Avoid binging on high-calorie foods, and go for healthy foods like vegetables, whole grain and high-fiber foods. Self-care is so important, especially in times of stress. Whether it is a nice warm bath with candles, or a yoga class, or maybe coffee with your friends. Whatever makes me you feel good and cared for. Take well-researched, doctor-formulated supplements like CortiSLIM which contain healthful ingredients that counter the effects of excess cortisol. If you find yourself frequently upset, do your best to follow a healthy eating and exercising regimen. Live a healthy lifestyle, and take supplements like CortiSLIM to prevent gaining extra pounds. We all have stress sometimes. For some people, it happens before having to speak in public. For other people, it might be before a first date. What causes stress for you may not be stressful for someone else. Sometimes stress is helpful – it can encourage you to meet a deadline or get things done. But long-term stress can increase the risk of diseases like depression, heart disease and a variety of other problems. There are very few among us who have never experienced stress. Whether it’s a pending work deadline or an overwhelming physical threat, our body’s response to stress can be both helpful and harmful. 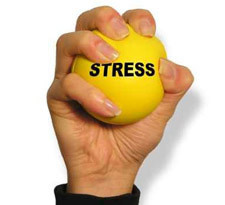 Our stress response gives us the strength and speed to ward off or flee from impending danger. But when it continues, stress increases cortisol levels and can put us at risk for obesity, heart disease, cancer, and a variety of other illnesses. [Stress System Malfunction Could Lead to Serious, Life Threatening Disease by George Chrousos, M.D., Chief of the Pediatric and Reproductive Endocrinology Branch at the National Institute of Child Health and Human Development and Philip Gold, MD, of the Clinical Neuroendocrinology Branch at the National Institute of Mental Health, National Institutes of Health, 2002]. A threat to your life or safety causes your body to undergo immediate physical changes. A chemical signal deep inside your brain speeds stress hormones through the bloodstream, preparing your body to be alert and prepared to escape danger. This is known as the “Flight or Fight” response. You have faster reaction times, your concentration becomes more focused, and your agility and strength increase. When the stressful situation ends, hormonal signals switch off the stress response and the body returns to normal. [George Chrousos, M.D., and Philip Gold, MD, National Institutes of Health, 2002]. But with today’s fast paced lifestyle, stress often doesn’t let up. Many of us now constantly experience anxiety and worry about work, relationships, money, the economy, college expenses, and job security-among others. As a result, the stress hormones produced by our body in anticipation of physical harm or threat continue to wash through the system in high levels, never leaving the blood and tissues. The stress response that gave our ancestors the speed and endurance to escape life-threatening dangers runs constantly in many modern people and never shuts down. If you have chronic stress, the best way to deal with it is to take care of the underlying problem. Counselling can help you find ways to relax and calm down. Supplements, like CortiSLIM, that have stress mitigating ingredients can be helpful. Supplements that reduce insulin resistance can be useful. Chromium in appropriate form and dosages has been shown to be an effective insulin sensitizing agent that reduces excess insulin as well as glucose. Calcium in appropriate form and dose may reduce fat deposition. Vanadium can reduce appetite as well as improve glucose utilization by cells, thereby reducing excess insulin production. Green Tea has been found to reduce absorption of fats, as well as reduce excess insulin production. Green Tea also has an effect that increases metabolism, thereby increasing calorie burning with normal daily activities. Also, Green Tea contains caffeine that in many instances can reduce stress. Magnolia Bark may reduce stress and cortisol secretion.